A soft drink (see terminology for other names) is a drink that typically contains carbonated water (although some lemonades are not carbonated), a sweetener, and a natural or artificial flavoring. The sweetener may be a sugar, high-fructose corn syrup, fruit juice, a sugar substitute (in the case of diet drinks), or some combination of these. Soft drinks may also contain caffeine, colorings, preservatives, and/or other ingredients. Soft drinks are called "soft" in contrast with "hard" alcoholic drinks. Small amounts of alcohol may be present in a soft drink, but the alcohol content must be less than 0.5% of the total volume of the drink in many countries and localities if the drink is to be considered non-alcoholic. Fruit punch, tea (even kombucha), and other such non-alcoholic drinks are technically soft drinks by this definition, but are not generally referred to as such. Soft drinks may be served chilled, over ice cubes, or at room temperature, especially soda. They are available in many container formats, including cans, glass bottles, and plastic bottles. Containers come in a variety of sizes, ranging from small bottles to large multi-liter containers. Soft drinks are widely available at fast food restaurants, movie theaters, convenience stores, casual-dining restaurants, dedicated soda stores, and bars from soda fountain machines. Soft drinks are typically served in paper or plastic disposable cups in the first three venues. In casual dining restaurants and bars, soft drinks are often served in glasses made from glass or plastic. Soft drinks may be drunk with straws or sipped directly from the cups. Soft drinks are mixed with other ingredients in several contexts. In Western countries, in bars and other places where alcohol is served (e.g. airplanes, restaurants and nightclubs), many mixed drinks are made by blending a soft drink with hard liquor and serving the drink over ice. 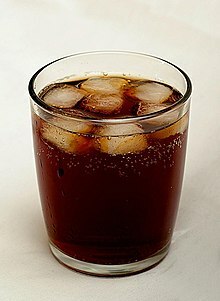 One well-known example is the rum and coke, which may also contain lime juice. Some homemade fruit punch recipes, which may or may not contain alcohol, contain a mixture of various fruit juices and a soft drink (e.g. ginger ale). At ice cream parlours and 1950s-themed diners, ice cream floats, and specifically root beer floats, are often sold. Examples of brands include Coca-Cola, Pepsi, Sprite, Sierra Mist, Fanta, Sunkist, Mountain Dew, Dr. Pepper, and 7 UP. While the term "soft drink" is commonly used in product labeling and on restaurant menus, in many countries these drinks are more commonly referred to by regional names, including carbonated drink, cool drink, cold drink, fizzy drink, fizzy juice, lolly water, pop, seltzer, soda, coke, soda pop, tonic, and mineral. Due to the high sugar content in typical soft drinks, they may also be called sugary drinks. In the United States, the 2003 Harvard Dialect Survey tracked the usage of the nine most common names. Over half of the survey respondents preferred the term "soda", which was dominant in the Northeastern United States, California, and the areas surrounding Milwaukee and St. Louis. The term "pop", which was preferred by 25% of the respondents, was most popular in the Midwest and Pacific Northwest, while the genericized trademark "coke", used by 12% of the respondents, was most popular in the Southern United States. The term "tonic" is hyperlocal to eastern Massachusetts, although usage is declining. In the English-speaking parts of Canada, the term "pop" is prevalent, but "soft drink" is the most common English term used in Montreal. In the United Kingdom and Ireland, the terms "fizzy drink" and the genericized trademark "coke" are common (though "coke" refers only to a cola of any brand). "Pop" and "fizzy pop" are used in Northern England and the Midlands, while "mineral" or "lemonade" (as a general term) are used in Ireland. In Scotland, "fizzy juice" or even simply "juice" is colloquially encountered. In Australia and New Zealand, "fizzy drink" or "soft drink" is typically used. In South African English, "cool drink" and "cold drink" are used, but in South African Indian English, "cool drink" is most prevalent. Older people often use the term "mineral". The origins of soft drinks lie in the development of fruit-flavored drinks. In the medieval Middle East, a variety of fruit-flavoured soft drinks were widely drunk, such as sharbat, and were often sweetened with ingredients such as sugar, syrup and honey. Other common ingredients included lemon, apple, pomegranate, tamarind, jujube, sumac, musk, mint and ice. Middle Eastern drinks later became popular in medieval Europe, where the word "syrup" was derived from Arabic. In Tudor England, 'water imperial' was widely drunk; it was a sweetened drink with lemon flavor and containing cream of tartar. 'Manays Cryste' was a sweetened cordial flavored with rosewater, violets or cinnamon. Another early type of soft drink was lemonade, made of water and lemon juice sweetened with honey, but without carbonated water. The Compagnie des Limonadiers of Paris was granted a monopoly for the sale of lemonade soft drinks in 1676. Vendors carried tanks of lemonade on their backs and dispensed cups of the soft drink to Parisians. It has been suggested that Carbonated drink be merged into this section. (Discuss) Proposed since January 2019. In the late 18th century, scientists made important progress in replicating naturally carbonated mineral waters. In 1767, Englishman Joseph Priestley first discovered a method of infusing water with carbon dioxide to make carbonated water when he suspended a bowl of distilled water above a beer vat at a local brewery in Leeds, England. His invention of carbonated water (also known as soda water) is the major and defining component of most soft drinks. Priestley found that water treated in this manner had a pleasant taste, and he offered it to his friends as a refreshing drink. In 1772, Priestley published a paper entitled Impregnating Water with Fixed Air in which he describes dripping oil of vitriol (or sulfuric acid as it is now called) onto chalk to produce carbon dioxide gas, and encouraging the gas to dissolve into an agitated bowl of water. Another Englishman, John Mervin Nooth, improved Priestley's design and sold his apparatus for commercial use in pharmacies. Swedish chemist Torbern Bergman invented a generating apparatus that made carbonated water from chalk by the use of sulfuric acid. Bergman's apparatus allowed imitation mineral water to be produced in large amounts. Swedish chemist Jöns Jacob Berzelius started to add flavors (spices, juices, and wine) to carbonated water in the late eighteenth century. Thomas Henry, an apothecary from Manchester, was the first to sell artificial mineral water to the general public for medicinal purposes, beginning in the 1770s. His recipe for 'Bewley's Mephitic Julep' consisted of 3 drachms of fossil alkali to a quart of water, and the manufacture had to 'throw in streams of fixed air until all the alkaline taste is destroyed'. Johann Jacob Schweppe developed a similar process to manufacture carbonated mineral water at the same time. He founded the Schweppes Company in Geneva in 1783 to sell carbonated water, and relocated his business to London in 1792. His drink soon gained in popularity; among his new found patrons was Erasmus Darwin. In 1843, Schweppes commercialised Malvern Water at the Holywell Spring in the Malvern Hills, and received a royal warrant from King William IV. It was not long before flavoring was combined with carbonated water. The earliest reference to carbonated ginger beer is in a Practical Treatise on Brewing. published in 1809. The drinking of either natural or artificial mineral water was considered at the time to be a healthy practice, and was promoted by advocates of temperance. Pharmacists selling mineral waters began to add herbs and chemicals to unflavored mineral water. They used birch bark (see birch beer), dandelion, sarsaparilla, fruit extracts, and other substances. Flavorings were also added to improve the taste. Soft drinks soon outgrew their origins in the medical world and became a widely consumed product, available cheaply for the masses. By the 1840s there were more than fifty soft drink manufacturers – an increase from just ten in the previous decade. Carbonated lemonade was widely available in British refreshment stalls in 1833, and in 1845 R. White's Lemonade went on sale in the UK. 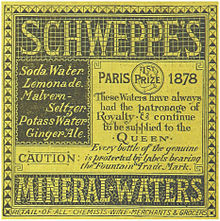 For the Great Exhibition of 1851 in London, Schweppes was designated the official drink supplier and sold over a million bottles of lemonade, ginger beer, Seltzer water and soda-water. There was a Schweppes soda water fountain, situated directly at the entrance to the exhibition. Mixer drinks became popular in the second half of the century. Tonic water was originally quinine added to water as a prophylactic against malaria and was consumed by British officials stationed in the tropical areas of South Asia and Africa. As the quinine powder was so bitter people began mixing the powder with soda and sugar, and a basic tonic water was created. The first commercial tonic water was produced in 1858. The mixed drink gin and tonic also originated in British colonial India, when the British population would mix their medicinal quinine tonic with gin. A persistent problem in the soft drinks industry was the lack of an effective sealing of the bottles. Carbonated drink bottles are under great pressure from the gas, so inventors tried to find the best way to prevent the carbon dioxide or bubbles from escaping. The bottles could also explode if the pressure was too great. Hiram Codd devised a patented bottling machine while working at a small mineral water works in the Caledonian Road, Islington, in London in 1870. His Codd-neck bottle was designed to enclose a marble and a rubber washer in the neck. The bottles were filled upside down, and pressure of the gas in the bottle forced the marble against the washer, sealing in the carbonation. The bottle was pinched into a special shape to provide a chamber into which the marble was pushed to open the bottle. This prevented the marble from blocking the neck as the drink was poured. By mid-1873 he had granted 20 licences and received a further 50 applications. This was boosted further by a Trade Show held in London in the same year. By 1874 the licence was free to bottle manufacturers as long as they purchased the marbles, sealing rings and used his groove tool, and the mineral water firms they traded with had already bought a licence to use his bottle. In 1892, the "Crown Cork Bottle Seal" was patented by William Painter, a Baltimore, Maryland machine shop operator. It was the first bottle top to successfully keep the bubbles in the bottle. In 1899, the first patent was issued for a glass-blowing machine for the automatic production of glass bottles. Earlier glass bottles had all been hand-blown. Four years later, the new bottle-blowing machine was in operation. It was first operated by the inventor, Michael Owens, an employee of Libby Glass Company. Within a few years, glass bottle production increased from 1,400 bottles a day to about 58,000 bottles a day. In the early 20th century, sales of bottled soda increased exponentially, and in the second half of the 20th century, canned soft drinks became an important share of the market. During the 1920s, "Home-Paks" were invented. "Home-Paks" are the familiar six-pack cartons made from cardboard. Vending machines also began to appear in the 1920s. Since then, soft drink vending machines have become increasingly popular. Both hot and cold drinks are sold in these self-service machines throughout the world. Per capita consumption of soda varies considerably around the world. As of 2014, the top consuming countries per capita were Argentina, the United States, Chile, and Mexico. Developed countries in Europe and elsewhere in the Americas had considerably lower consumption. Annual average consumption in the United States, at 153.5 liters, was about twice that in the United Kingdom (77.7) or Canada (85.3). From 2009 to 2014 consumption dropped over 4% per year in Greece, Romania, Portugal, and Croatia (putting these countries at betwen 34.7 and 51.0 liters per year). Over the same period, consumption grew over 20% per year in three countries, resulting in per-capita consumption of 19.1 liters in Cameroon, 43.9 liters in Georgia, and 10.0 liters in Vietnam. Soft drinks are made by mixing dry or fresh ingredients with water. Production of soft drinks can be done at factories or at home. Soft drinks can be made at home by mixing a syrup or dry ingredients with carbonated water, or by lacto-fermentation. 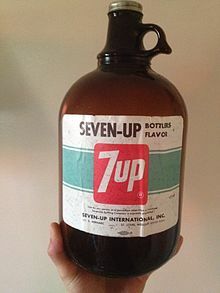 Syrups are commercially sold by companies such as Soda-Club; dry ingredients are often sold in pouches, in a style of the popular U.S. drink mix Kool-Aid. Carbonated water is made using a soda siphon or a home carbonation system or by dropping dry ice into water. Food-grade carbon dioxide, used for carbonating drinks, often comes from ammonia plants. Drinks like ginger ale and root beer are often brewed using yeast to cause carbonation. Of most importance is that the ingredient meets the agreed specification on all major parameters. This is not only the functional parameter (in other words, the level of the major constituent), but the level of impurities, the microbiological status, and physical parameters such as color, particle size, etc. Some soft drinks contain measurable amounts of alcohol. In some older preparations, this resulted from natural fermentation used to build the carbonation. In the United States, soft drinks (as well as other products such as non-alcoholic beer) are allowed by law to contain up to 0.5% alcohol by volume. Modern drinks introduce carbon dioxide for carbonation, but there is some speculation that alcohol might result from fermentation of sugars in a non-sterile environment. A small amount of alcohol is introduced in some soft drinks where alcohol is used in the preparation of the flavoring extracts such as vanilla extract. In every area of the world there are major soft drink producers. However, a few major North American companies are present in most of the countries of the world, such as Pepsi and Coca Cola. Major North American producers other than the two previously-named companies include Cott, Dr Pepper Snapple Group, and Jones Soda. The over-consumption of sugar-sweetened soft drinks is associated with obesity, hypertension, type 2 diabetes, dental caries, and low nutrient levels. Experimental studies tend to support a causal role for sugar-sweetened soft drinks in these ailments, though this is challenged by other researchers. "Sugar-sweetened" includes drinks that use high-fructose corn syrup, as well as those using sucrose. Many soft drinks contain ingredients that are themselves sources of concern: caffeine is linked to anxiety and sleep disruption when consumed in excess. Sodium benzoate has been investigated by researchers at University of Sheffield as a possible cause of DNA damage and hyperactivity. Other substances have negative health effects, but are present in such small quantities that they are unlikely to pose any substantial health risk provided that the drinks are consumed only in moderation. In 1998, the Center for Science in the Public Interest published a report titled Liquid Candy: How Soft Drinks are Harming Americans' Health. The report examined statistics relating to the increase in soft drink consumption and claimed that consumption is "likely contributing to health problems". It also criticized marketing efforts by soft drink companies. In 2005, the CSPI called for warning labels on soft drinks, similar to those on cigarettes and alcohol. From 1977 to 2002, Americans doubled their consumption of sweetened beverages—a trend that was paralleled by doubling the prevalence of obesity. The consumption of sugar-sweetened beverages is associated with weight and obesity, and changes in consumption can help predict changes in weight. It remains possible that the correlation is due to a third factor: people who lead unhealthy lifestyles might consume more soft drinks. If so, then the association between soft drink consumption and weight gain could reflect the consequences of an unhealthy lifestyle rather than the consequences of consuming soft drinks. Experimental evidence is needed to definitively establish the causal role of soft drink consumption. Reviews of the experimental evidence suggest that soft drink consumption does cause weight gain, but the effect is often small except for overweight individuals. Many of these experiments examined the influence of sugar-sweetened soft drinks on weight gain in children and adolescents. In one experiment, adolescents replaced sugar-sweetened soft drinks in their diet with artificially sweetened soft drinks that were sent to their homes over 25 weeks. Compared with children in a control group, children who received the artificially sweetened drinks saw a smaller increase in their BMI (by −0.14 kg/m2), but this effect was only statistically significant among the heaviest children (who saw a benefit of −0.75 kg/m2). In another study, an educational program encouraged schoolchildren to consume fewer soft drinks. During the school year, the prevalence of obesity decreased among children in the program by 0.2%, compared to a 7.5% increase among children in the control group. Another study, published in Pediatrics in 2013, concluded that for children from the age of 2 to 5, their risk of obesity increased by 43% if they were regular soft drink consumers as opposed to those who rarely or never consumed them. Sugar-sweetened drinks have also been speculated to cause weight gain in adults. In one study, overweight individuals consumed a daily supplement of sucrose-sweetened or artificially sweetened drinks or foods for a 10-week period. Most of the supplement was in the form of soft drinks. Individuals in the sucrose group gained 1.6 kg, and individuals in the artificial-sweetener group lost 1.0 kg. A two-week study had participants supplement their diet with sugar-sweetened soft drinks, artificially sweetened soft drinks, or neither. Although the participants gained the most weight when consuming the sugar-sweetened drinks, some of the differences were unreliable: the differences between men who consumed sugar-sweetened drinks or no drinks was not statistically significant. Other research suggests that soft drinks could play a special role in weight gain. One four-week experiment compared a 450 calorie/day supplement of sugar-sweetened soft drinks to a 450 calorie/day supplement of jelly beans. The jelly bean supplement did not lead to weight gain, but the soft drink supplement did. The likely reason for the difference in weight gain is that people who consumed the jelly beans lowered their caloric intake at subsequent meals, while people who consumed soft drinks did not. Thus, the low levels of satiety provided by sugar-sweetened soft drinks may explain their association with obesity. That is, people who consume calories in sugar-sweetened drinks may fail to adequately reduce their intake of calories from other sources. Indeed, people consume more total calories in meals and on days when they are given sugar-sweetened drinks than when they are given artificially sweetened drinks or water. However, these results are contradicted by a study by Adam Drewnowski published in 2004, in which "32 subjects consumed a 300-calorie snack of fat-free raspberry cookies or regular cola on two occasions each – either two hours ("early") or 20 minutes ("late") before lunch." It found that "...the calories eaten at lunch were not affected by whether the snack was cookies or cola." The consumption of sugar-sweetened soft drinks can also be associated with many weight-related diseases, including diabetes, metabolic syndrome and cardiovascular risk factors, and elevated blood pressure. According to research presented at the American Heart Association's Epidemiology and Prevention/Nutrition, Physical Activity and Metabolism 2013 Scientific Sessions by researchers at the Harvard School of Public Health, sugar-sweetened beverages may be responsible for 180,000 deaths every year worldwide. Soft drinks displayed on grocery store shelves. Most soft drinks contain high concentrations of simple carbohydrates: glucose, fructose, sucrose and other simple sugars. If oral bacteria ferment carbohydrates and produce acids that may dissolve tooth enamel and induce dental decay, then sweetened drinks may increase the risk of dental caries. The risk would be greater if the frequency of consumption is high. A large number of soda pops are acidic as are many fruits, sauces and other foods. Drinking acidic drinks over a long period and continuous sipping may erode the tooth enamel. A 2007 study determined that some flavored sparkling waters are as erosive or more so than orange juice. Using a drinking straw is often advised by dentists as the drink does not come into as much contact with the teeth. It has also been suggested that brushing teeth right after drinking soft drinks should be avoided as this can result in additional erosion to the teeth due to the presence of acid. There have been a handful of published reports describing individuals with severe hypokalemia (low potassium levels) related to extreme consumption of colas. In a meta-analysis of 88 studies, drinking soda correlates with a decrease in milk consumption along with the vitamin D, vitamin B6, vitamin B12, calcium, protein and other micronutrients. Phosphorus, a micronutrient, can be found in cola-type drinks, but there may be a risk in consuming too much. Phosphorus and calcium are used in the body to create calcium-phosphate, which is the main component of bone. However, the combination of too much phosphorus with too little calcium in the body can lead to a degeneration of bone mass. Research suggests a statistically significant inverse relationship between consumption of carbonated drinks and bone mineral density in young girls, which places them at increased risk of fractures. One hypothesis to explain this relationship is that the phosphoric acid contained in some soft drinks (colas) displaces calcium from the bones, lowering bone density of the skeleton and leading to weakened bones, or osteoporosis. However, 2001 calcium metabolism studies by Dr. Robert Heaney suggested that the net effect of carbonated soft drinks, (including colas, which use phosphoric acid as the acidulant) on calcium excretion in urine was negligible. Heaney concluded that carbonated soft drinks, which do not contain the nutrients needed for bone health, may displace other foods which do, and that the real issue is that people who drink a lot of soft drinks also tend to have an overall diet that is low in calcium. A 2006 study of several thousand men and women, found that women who regularly drank cola-based sodas (three or more a day) had significantly lower bone mineral density (BMD) of ≈4 % in the hip than those who didn't, even though researchers controlled for important factors like calcium and vitamin D intake. The study also found that women who drank non-cola soft drinks didn't appear to have lower BMD and that BMD of women drinking decaffeineted cola wasn't as low as women drinking caffeinated cola sodas. The study found that the effect of regular consumption of cola sodas was not significant on men's BMD. In the 1950s and 1960s there were attempts in France and Japan to ban the sale of Coca-Cola as dangerous since phosphates can block calcium absorption. However, these were unsuccessful as the amounts of phosphate were shown to be too small to have a significant effect. The USDA's recommended daily intake (RDI) of added sugars is less than 10 teaspoons per day for a 2,000-calorie diet. High caloric intake contributes to obesity if not balanced with exercise, with a large amount of exercise being required to offset even small but calorie-rich food and drinks. Until 1985, most of the calories in soft drinks came from sugar or corn syrup. As of 2010, in the United States high-fructose corn syrup (HFCS) is used nearly exclusively as a sweetener because of its lower cost, while in Europe, sucrose dominates, because EU agricultural policies favor production of sugar beets in Europe proper and sugarcane in the former colonies over the production of corn. HFCS has been criticized as having a number of detrimental effects on human health, such as promoting diabetes, hyperactivity, hypertension, and a host of other problems. Although anecdotal evidence has been presented to support such claims, it is well known that the human body breaks sucrose down into glucose and fructose before it is absorbed by the intestines. Simple sugars such as fructose are converted into the same intermediates as in glucose metabolism. However, metabolism of fructose is extremely rapid and is initiated by fructokinase. Fructokinase activity is not regulated by metabolism or hormones and proceeds rapidly after intake of fructose. While the intermediates of fructose metabolism are similar to those of glucose, the rates of formation are excessive. This fact promotes fatty acid and triglyceride synthesis in the liver, leading to accumulation of fat throughout the body and possibly non-alcoholic fatty liver disease. Increased blood lipid levels also seem to follow fructose ingestion over time. A sugar drink or high-sugar drink may refer to any drink consisting primarily of water and sugar (often cane sugar or high-fructose corn syrup), including some soft drinks, some fruit juices, and energy drinks. In 2006, the United Kingdom Food Standards Agency published the results of its survey of benzene levels in soft drinks, which tested 150 products and found that four contained benzene levels above the World Health Organization (WHO) guidelines for drinking water. The United States Food and Drug Administration released its own test results of several soft drinks containing benzoates and ascorbic or erythorbic acid. Five tested drinks contained benzene levels above the Environmental Protection Agency's recommended standard of 5 ppb. As of 2006, the FDA stated its belief that "the levels of benzene found in soft drinks and other beverages to date do not pose a safety concern for consumers". In 2003, the Delhi non-profit Centre for Science and Environment published a disputed report finding pesticide levels in Coke and Pepsi soft drinks sold in India at levels 30 times that considered safe by the European Economic Community. This was found in primarily 12 cold drink brands sold in and around New Delhi. The Indian Health Minister said the CSE tests were inaccurate, and said that the government's tests found pesticide levels within India's standards but above EU standards. A similar CSE report in August 2006 prompted many state governments to have issued a ban of the sale of soft drinks in schools. Kerala issued a complete ban on the sale or manufacture of soft drinks altogether. (These were later struck down in court.) In return, the soft drink companies like Coca-Cola and Pepsi have issued ads in the media regarding the safety of consumption of the drinks. The UK-based Central Science Laboratory, commissioned by Coke, found its products met EU standards in 2006. Coke and the University of Michigan commissioned an independent study of its bottling plants by The Energy and Resources Institute (TERI), which reported in 2008 no unsafe chemicals in the water supply used. A study published in the Clinical Journal of the American Society of Nephrology in 2013 concluded that consumption of soft drinks was associated with a 23% higher risk of developing kidney stones. Since at least 2006, debate on whether high-calorie soft drink vending machines should be allowed in schools has been on the rise. Opponents of the (soft drink) vending machines believe that soft drinks are a significant contributor to childhood obesity and tooth decay, and that allowing soft drink sales in schools encourages children to believe they are safe to consume in moderate to large quantities. Opponents argue that schools have a responsibility to look after the health of the children in their care, and that allowing children easy access to soft drinks violates that responsibility. Vending machine proponents believe that obesity is a complex issue and soft drinks are not the only cause. A 2011 bill to tax soft drinks in California failed, with some opposing lawmakers arguing that parents—not the government—should be responsible for children's drink choices. On May 3, 2006, the Alliance for a Healthier Generation, Cadbury Schweppes, The Coca-Cola Company, PepsiCo, and the American Beverage Association announced new guidelines that will voluntarily remove high-calorie soft drinks from all U.S. schools. On May 19, 2006, the British education secretary, Alan Johnson, announced new minimum nutrition standards for school food. Among a wide range of measures, from September 2006, school lunches will be free from carbonated drinks. Schools will also end the sale of junk food (including carbonated drinks) in vending machines and tuck shops. In 2008, Samantha K Graff published an article in the Annals of the American Academy of Political and Social Science regarding the "First Amendment Implications of Restricting Food and Beverages Marketing in Schools". The article examines a school district's policy regarding limiting the sale and marketing of soda in public schools, and how certain policies can invoke a violation of the First Amendment. Due to district budget cuts and loss in state funding, many school districts allow commercial businesses to market and advertise their product (including junk food and soda) to public school students for additional revenue. Junk food and soda companies have acquired exclusive rights to vending machines throughout many public school campuses. Opponents of corporate marketing and advertising on school grounds urge school officials to restrict or limit a corporation's power to promote, market, and sell their product to school students. In the 1970s, the Supreme Court ruled that advertising was not a form of free expression, but a form of business practices which should be regulated by the government. In the 1976 case of Virginia State Board of Pharmacy v. Virginia Citizens Consumer Council, the Supreme Court ruled that advertising, or "commercial speech", to some degree is protected under the First Amendment. To avoid a First Amendment challenge by corporations, public schools could create contracts that restrict the sale of certain product and advertising. Public schools can also ban the selling of all food and drink products on campus, while not infringing on a corporation's right to free speech. On December 13, 2010, President Obama signed the Healthy Hunger Free Kids Act of 2010 (effective in 2014) that mandates schools that receive federal funding must offer healthy snacks and drinks to students. The act bans the selling of soft drinks to students and requires schools to provide healthier options such as water, unflavored low-fat milk, 100% fruit and vegetable drinks or sugar-free carbonated drinks. The portion sizes available to students will be based on age: eight ounces for elementary schools, twelve ounces for middle and high schools. Proponents of the act predict the new mandate it will make it easier for students to make healthy drink choices while at school. In 2015, Terry-McElarth and colleagues published a study in the American Journal of Preventative Medicine on regular soda policies and their effect on school drink availability and student consumption. The purpose of the study was to determine the effectiveness of a program beginning in the 2014–2015 school year that requires schools participating in federally reimbursable meal programs to remove all competitive venues (a la carte cafeteria sales, vending machines, and stores/snack bars/carts), on the availability of unhealthy drinks at schools and student consumption. The study analyzed state- and school district-level policies mandating soda bans and found that state bans were associated with significantly lower school soda availability but district bans showed no significant associations. In addition, no significant correlation was observed between state policies and student consumption. Among student populations, state policy was directly associated with significantly lower school soda availability and indirectly associated with lower student consumption. The same was not observed for other student populations. In the United States, legislators, health experts and consumer advocates are considering levying higher taxes on the sale of soft drinks and other sweetened products to help curb the epidemic of obesity among Americans, and its harmful impact on overall health. Some speculate that higher taxes could help reduce soda consumption. Others say that taxes should help fund education to increase consumer awareness of the unhealthy effects of excessive soft drink consumption, and also help cover costs of caring for conditions resulting from overconsumption. The food and drink industry holds considerable clout in Washington, DC, as it has contributed more than $50 million to legislators since 2000. In January 2013, a British lobby group called for the price of sugary fizzy drinks to be increased, with the money raised (an estimated £1 billion at 20p per litre) to be put towards a "Children's Future Fund", overseen by an independent body, which would encourage children to eat healthily in school. In 2017, the Kingdom of Saudi Arabia, the United Arab Emirates and the Kingdom of Bahrain imposed a 50% tax on soft drinks and a 100% tax on energy drinks to curb excess consumption of the commodity and for additional revenue. ^ "Electronic Code of Federal Regulations". United States Government. Archived from the original on June 13, 2011. Retrieved February 25, 2011. See §7.71, paragraphs (e) and (f). ^ "What Is Meant By Alcohol-Free? : The Alcohol-Free Shop". Alcoholfree.co.uk. January 8, 2012. Retrieved 2013-03-26. ^ a b Vaux, Bert (2003). "105. What is your generic term for a sweetened carbonated beverage?". Harvard Dialect Survey. Retrieved 2011-06-03. ^ a b "Funny Irish Words and Phrases". Grammar.yourdictionary.com. Retrieved 2013-03-26. ^ "In Boston, the word 'tonic' gives way to 'soda'". BostonGlobe.com. Retrieved September 8, 2015. ^ "Why do some places say 'pop' and others say 'soda'? Your questions answered". The Globe and Mail. Retrieved September 8, 2015. ^ "The Best of British". effingpot.com. Retrieved September 8, 2015. ^ For example, in "Coca-Cola Amatil admits cutting back on sugar as attitudes change on health and investment" – The Sydney Morning Herald, September 11, 2015. Retrieved September 12, 2015. ^ "Definition of "cool drink"". Collins English Dictionary. Retrieved September 11, 2015. ^ a b c d e Colin Emmins. "SOFT DRINKS Their origins and history" (PDF). ^ "Soft Drink". Encyclopædia Britannica. http://www.britannica.com/EBchecked/topic/552397/soft-drink. ^ Mary Bellis (March 6, 2009). "Joseph Priestley — Soda Water — Joseph Priestley". Inventors.about.com. Retrieved 2009-06-08. ^ a b "Impregnating Water with Fixed Air" (PDF). Retrieved 2013-05-08. ^ Morgenthaler, Jeffrey (2014). Bar Book: Elements of Cocktail Technique. Chronicle Books. p. 54. ISBN 9781452130279. ^ "Heritage:Meet Jacob Schweppe". Archived from the original on October 12, 2018. Retrieved July 6, 2015. ^ Emmins, Colin (1991). SOFT DRINKS – Their origins and history (PDF). Great Britain: Shire Publications Ltd. p. 8 and 11. ISBN 0 7478 0125 8. ^ "Chester homeless charity teams up with lemonade brand". Chester Chronicle. October 8, 2017. ^ Raustiala, Kal. "The Imperial Cocktail". Slate. The Slate Group. Retrieved August 30, 2013. ^ ''Wildfell Hall'', ch. 30. Books.google.com. 1922. Retrieved 2013-03-26. ^ Silver, Marc (19 June 2015). "Guess Which Country Has The Biggest Increase In Soda Drinking". National Public Radio. ^ "CO2 shortage: Food industry calls for government action". BBC. Jun 21, 2018. ^ Ashurst, P. (2009). Soft drink and fruit juice problems solved. Woodhead Publishing Limited. ISBN 978-1-84569-326-8. ^ "[myMasjid.com.my] Alcohol: In soft drinks". Mail-archive.com. November 8, 2004. Retrieved 2009-06-08. ^ Bes-Rastrollo, M; Sayon-Orea, C; Ruiz-Canela, M; Martinez-Gonzalez, MA (July 2016). "Impact of sugars and sugar taxation on body weight control: A comprehensive literature review". Obesity (Silver Spring, Md.). 24 (7): 1410–26. doi:10.1002/oby.21535. PMID 27273733. ^ a b c d Malik VS, Schulze MB, Hu FB (2006). "Intake of sugar-sweetened beverages and weight gain: a systematic review". The American Journal of Clinical Nutrition. 84 (2): 274–88. PMC 3210834. PMID 16895873. ^ a b c d e Vartanian LR, Schwartz MB, Brownell KD (2007). "Effects of soft drink consumption on nutrition and health: a systematic review and meta-analysis". American Journal of Public Health. 97 (4): 667–75. doi:10.2105/AJPH.2005.083782. PMC 1829363. PMID 17329656. ^ Woodward-Lopez G, Kao J, Ritchie L (2011). "To what extent have sweetened beverages contributed to the obesity epidemic?". Public Health Nutrition. 14 (3): 499–509. doi:10.1017/S1368980010002375. PMID 20860886. ^ Kim, Y; Je, Y (April 2016). "Prospective association of sugar-sweetened and artificially sweetened beverage intake with risk of hypertension". Archives of Cardiovascular Diseases. 109 (4): 242–53. doi:10.1016/j.acvd.2015.10.005. PMID 26869455. ^ a b Imamura F, O'Connor L, Ye Z, Mursu J, Hayashino Y, Bhupathiraju SN, Forouhi NG (2015). "Consumption of sugar sweetened beverages, artificially sweetened beverages, and fruit juice and incidence of type 2 diabetes: systematic review, meta-analysis, and estimation of population attributable fraction". BMJ. 351: h3576. doi:10.1136/bmj.h3576. PMC 4510779. PMID 26199070. ^ a b Gibson S (2008). "Sugar-sweetened soft drinks and obesity: a systematic review of the evidence from observational studies and interventions". Nutrition Research Reviews. 21 (2): 134–47. doi:10.1017/S0954422408110976. PMID 19087367. ^ Wolff E, Dansinger ML (2008). "Soft drinks and weight gain: how strong is the link?". Medscape Journal of Medicine. 10 (8): 189. PMC 2562148. PMID 18924641. ^ Trumbo PR, Rivers CR (2014). "Systematic review of the evidence for an association between sugar-sweetened beverage consumption and risk of obesity". Nutrition Reviews. 72 (9): 566–74. doi:10.1111/nure.12128. PMID 25091794. ^ Michael F Jacobson PhD, Liquid Candy: How Soft Drinks are Harming Americans' Health, (CSPI, Washington DC 1998; 2nd Ed. 2005). ^ Morales, Tatiana (July 14, 2005). "Warning Labels On Soda?". CBSNews. Retrieved August 11, 2017. ^ Nielsen, S.; Popkin, B. (2004). "Changes in beverage intake between 1977 and 2001". American Journal of Preventive Medicine. 27 (3): 205–210. doi:10.1016/j.amepre.2004.05.005. PMID 15450632. ^ Flegal, K.M. ; Carroll, M.D. ; Ogden, C.L. ; Johnson, C.L. (2002). "Prevalence and trends in overweight among US adults, 1999–2000" (PDF). Journal of the American Medical Association. 288 (14): 1723–1727. doi:10.1001/jama.288.14.1723. PMID 12365955. Archived from the original (PDF) on January 15, 2013. ^ Ebbeling, C.B. ; Feldman, H.A. ; Osganian, S.K. ; Chomitz, V.R. ; Ellenbogen, S.J. ; Ludwig, D.S. (2006). "Effects of decreasing sugar-sweetened beverage consumption on body weight in adolescents: A randomized, controlled pilot study". Pediatrics. 117 (3): 673–680. doi:10.1542/peds.2005-0983. PMID 16510646. ^ James J, Thomas P, Cavan D, Kerr D (2004). "Preventing childhood obesity by reducing consumption of carbonated drinks: cluster randomised controlled trial". BMJ. 328 (7450): 1237. doi:10.1136/bmj.38077.458438.EE. PMC 416601. PMID 15107313. ^ DeBoer MD, Scharf RJ, Demmer RT (2013). "Sugar-sweetened beverages and weight gain in 2- to 5-year-old children". Pediatrics. 132 (3): 413–20. doi:10.1542/peds.2013-0570. PMC 3876761. PMID 23918897. ^ de Ruyter JC, Olthof MR, Seidell JC, Katan MB (2012). "A trial of sugar-free or sugar-sweetened beverages and body weight in children". The New England Journal of Medicine. 367 (15): 1397–406. doi:10.1056/NEJMoa1203034. PMID 22998340. ^ a b Raben A, Vasilaras TH, Møller AC, Astrup A (2002). "Sucrose compared with artificial sweeteners: different effects on ad libitum food intake and body weight after 10 wk of supplementation in overweight subjects". The American Journal of Clinical Nutrition. 76 (4): 721–9. PMID 12324283. ^ a b Tordoff, M.G. ; Alleva, AM. (1990). "Effect of drinking soda sweetened with aspartame or high-fructose corn syrup on food intake and body weight". American Journal of Clinical Nutrition. 51 (6): 963–969. PMID 2349932. ^ DiMeglio, D.P. ; Mattes, R.D. (2000). "Liquid versus solid carbohydrate: effects on food intake and body weight". Int J Obes Relat Metab Disord. 24 (6): 794–800. doi:10.1038/sj.ijo.0801229. PMID 10878689. ^ Van Wymelbeke, V.; Beridot-Therond, M.E. ; de La Gueronniere, V.; Fantino, M. (2004). "Influence of repeated consumption of beverages containing sucrose or intense sweeteners on food intake". Eur J Clin Nutr. 58 (1): 154–161. doi:10.1038/sj.ejcn.1601762. PMID 14679381. ^ a b Rolls, B.J. ; Kim, S.; Fedoroff, I.C. (1990). "Effects of drinks sweetened with sucrose or aspartame on hunger, thirst and food intake in men". Physiol. Behav. 48 (1): 19–26. doi:10.1016/0031-9384(90)90254-2. PMID 2236270. ^ Almiron-Roig; Flores; Drewnowski (2004). "No difference in satiety or in subsequent energy intakes between a beverage and a solid food". Physiol. Behav. 82 (4): 19–26. doi:10.1016/j.physbeh.2004.06.003. PMID 15327915. ^ Yoo S, Nicklas T, Baranowski T, Zakeri IF, Yang SJ, Srinivasan SR, Berenson GS (2004). "Comparison of dietary intakes associated with metabolic syndrome risk factors in young adults: the Bogalusa Heart Study". The American Journal of Clinical Nutrition. 80 (4): 841–8. PMID 15447888. ^ "180,000 deaths worldwide may be associated with sugary soft drinks". heart.org. Archived from the original on July 25, 2013. ^ Marshall TA, Levy SM, Broffitt B, Warren JJ, Eichenberger-Gilmore JM, Burns TL, Stumbo PJ (2003). "Dental caries and beverage consumption in young children". Pediatrics. 112 (3 Pt 1): e184–91. PMID 12949310. ^ Brown, Catronia J.; Smith, Gay; Shaw, Linda; Parry, Jason; Smith, Anthony J. (March 2007). "The erosive potential of flavoured sparkling water drinks". International Journal of Paediatric Dentistry. British Paedodontic Society and the International Association of Dentistry for Children. 17 (2): 86–91. doi:10.1111/j.1365-263X.2006.00784.x. PMID 17263857. ^ Bassiouny MA, Yang J (2005). "Influence of drinking patterns of carbonated beverages on dental erosion". General Dentistry. 53 (3): 205–10. PMID 15960479. Lay summary – ScienceDaily (June 17, 2005). ^ Sharma R, Guber HA (2013). "Cola-induced hypokalemia-a case report and review of the literature". Endocr Pract (Review). 19 (1): e21–3. doi:10.4158/EP12241.CR. PMID 23186978. ^ a b c "Sugary Drinks or Diet Drinks: What's the Best Choice?". Harvard School of Public Health. Retrieved 2011-10-14. ^ McGartland C, Robson PJ, Murray L, Cran G, Savage MJ, Watkins D, Rooney M, Boreham C (2003). "Carbonated soft drink consumption and bone mineral density in adolescence: the Northern Ireland Young Hearts project". Journal of Bone and Mineral Research. 18 (9): 1563–9. doi:10.1359/jbmr.2003.18.9.1563. PMID 12968664. ^ a b Heaney RP, Rafferty K (2001). "Carbonated beverages and urinary calcium excretion". The American Journal of Clinical Nutrition. 74 (3): 343–7. PMID 11522558. ^ Tucker KL, Morita K, Qiao N, Hannan MT, Cupples LA, Kiel DP (2006). "Colas, but not other carbonated beverages, are associated with low bone mineral density in older women: The Framingham Osteoporosis Study". The American Journal of Clinical Nutrition. 84 (4): 936–42. PMID 17023723. ^ "Pure Cane Sugar Vs. High Fructose Corn Syrup". livestrong.com. Retrieved 2012-04-23. ^ "The Dangers of High Fructose Corn Syrup". diabeteshealth.org. Archived from the original on June 26, 2014. Retrieved April 23, 2012. ^ "The Murky World of High Fructose Corn Syrup". Westonaprice.org. Archived from the original on March 5, 2010. Retrieved 2009-06-08. ^ "Pathways for the Interconversion of Sugars, University of Illinois Chicago, Medical Biochemistry 531, Lecture 21" (PDF). Archived from the original (PDF) on April 9, 2008. Retrieved 2013-03-26. ^ "of benzene levels in soft drinks". Food.gov.uk. March 31, 2006. Archived from the original on October 6, 2008. Retrieved June 8, 2009. ^ "US FDA/CFSAN – Questions and Answers on the Occurrence of Benzene in Soft Drinks and Other Beverages". Archived from the original on March 26, 2008. Retrieved 2008-03-26. ^ "Centre for Science and Environment, Pesticides in coke". Cseindia.org. Archived from the original on September 4, 2015. Retrieved March 26, 2013. ^ "Down to Earth, Magazine, Pesticides in coke". Downtoearth.org.in. Archived from the original on July 9, 2012. Retrieved 2013-03-26. ^ Our Corporate Bureau (October 29, 2003). "Coke sales fall 11% on pesticide controversy". New Delhi: Business-standard.com. Retrieved 2009-11-09. ^ "Pepsi: Repairing a Poisoned Reputation in India". Businessweek.com. May 31, 2007. Archived from the original on January 17, 2010. Retrieved 2009-11-09. ^ "Toxic Pesticides Found in India's Soft Drinks". Ens-newswire.com. August 5, 2003. Retrieved 2013-05-08. ^ "CNN.com — India gives cola giants all-clear — Aug. 22, 2003". Edition.cnn.com. August 22, 2003. Retrieved 2009-11-09. ^ George, Nirmala (August 22, 2003). "Colas called safe, but not at EU standards". The San Diego Union. Archived from the original on September 5, 2010. ^ "South Asia | UK experts say Indian Coke 'safe'". BBC News. August 14, 2006. Retrieved 2009-11-09. ^ Sharma, Ashok (January 15, 2008). "Water in Coca-Cola in India pesticide free". Usatoday.Com. Retrieved 2009-11-09. ^ Ferraro PM, Taylor EN, Gambaro G, Curhan GC (2013). "Soda and other beverages and the risk of kidney stones". Clinical Journal of the American Society of Nephrology. 8 (8): 1389–95. doi:10.2215/CJN.11661112. PMC 3731916. PMID 23676355. ^ "Non-diet sodas to be pulled from schools". Associated Press. May 5, 2006. ^ "Issue 17: Debates from four states over selling soda in schools". Berkeley Media Studies Group. November 1, 2008. Archived from the original on October 12, 2013. Retrieved January 4, 2019. ^ "State's soda tax plan falls flat". Daily Democrat. May 29, 2013. ^ "Soda tax nixed in state assembly committee". ABC News Los Angeles. April 25, 2011. ^ Clockwork.net. "Alliance for a Healthier Generation". HealthierGeneration.org. Retrieved February 13, 2017. ^ Clockwork.net. "Schools". HealthierGeneration.org. Archived from the original on September 1, 2010. Retrieved February 13, 2017. ^ "Va. Pharmacy Bd. v. Va. Consumer Council 425 U.S. 748 (1976)". Justia.com. Retrieved February 13, 2017. ^ Graff, S. K. (2008). "First Amendment Implications of Restricting Food and Beverage Marketing in Schools". The Annals of the American Academy of Political and Social Science. 615 (1): 157–77. doi:10.1177/0002716207308398. JSTOR 25097981. ^ "Healthy Hunger-Free Kids Act – Food and Nutrition Service". USDA.gov. Retrieved February 13, 2017. ^ "Healthy Hunger-Free Kids Act | Food and Nutrition Service". www.fns.usda.gov. Retrieved March 4, 2016. ^ Terry-McElrath YM, Chriqui JF, O'Malley PM, Chaloupka FJ, Johnston LD (2015). "Regular soda policies, school availability, and high school student consumption". American Journal of Preventive Medicine. 48 (4): 436–44. doi:10.1016/j.amepre.2014.10.022. PMC 4380673. PMID 25576493. ^ Duffey KJ, Gordon-Larsen P, Shikany JM, Guilkey D, Jacobs DR, Popkin BM (2010). "Food price and diet and health outcomes: 20 years of the CARDIA Study". Archives of Internal Medicine. 170 (5): 420–6. doi:10.1001/archinternmed.2009.545. PMC 3154748. PMID 20212177. ^ "USA Today, Experts: penny per ounce to fight obesity, health costs. Sept 18 2009". September 18, 2009. Retrieved 2010-04-11. ^ "Center for Responsive Politics, Food and Beverage industry profile". Opensecrets.org. February 18, 2013. Retrieved 2013-03-26. ^ "61 organisations call for a sugary drinks duty". Govtoday.co.uk. January 29, 2013. Archived from the original on February 16, 2013. Retrieved 2013-03-26. ^ "New York Soda Ban Struck Down, Bloomberg Promises Appeal – US News and World Report". USNews.com. March 11, 2013. Retrieved 2013-03-26. Wikimedia Commons has media related to Soft drink. Look up soft drink in Wiktionary, the free dictionary. Wikivoyage has a travel guide for Soft drink. This page was last edited on 18 April 2019, at 10:55 (UTC).